Visits to grandma are a bore for Ben – until he discovers she’s an accomplished international jewel thief and has been plotting to steal the crown jewels all her life. Meet actress Gilly Tompkins who starred as Gangsta Granny in the premiere stage production of Gangsta Granny on National tour and in London’s West End. 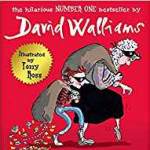 Discover how Gilly gets into character for the stage shows, the fun moments the actors have shared with the author and enjoy readings from some of David Walliams’ best-loved books. There will be a Q&A – where you can ask Gilly anything about being an actress and of course Gangsta Granny. Just so you know – Gilly may need some help reading the books!